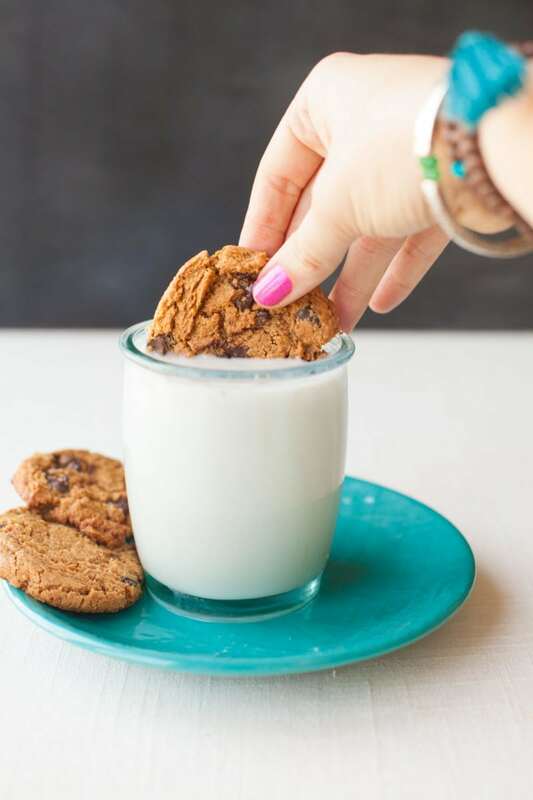 These Chocolate Chip Almond Butter Cookies only require six ingredients, are dairy- and gluten-free...and still manage to be decadent and rich! I’d like to introduce you to, quite possibly, my favorite cookie in the entire world. And if you’ve ever had my Mama’s crazy awesome chocolate chip cookies, you’d know it’s really saying something to elevate these babies above those. The reason I love these almond butter cookies so much isn’t just because they taste amazing (they so do), but it’s also because, at just six ingredients total, they are beautifully simple, and actually kinda healthy. But not in a “I’m chewing on a piece of cardboard that’s supposed to taste like a cookie” kind of healthy. An actual, honest-to-god, decadent, richy, chocolatey, chewy, just-happens-to-be-healthier kind of healthy. I first tasted these cookies in 2010, when my über-health-conscious sister-in-law brought me one she’d made (she hand-delivered it to me in a little baggie at my mother-in-law’s kitchen table, in fact). I was totally bowled over—especially when she told me they had no flour in them at all! 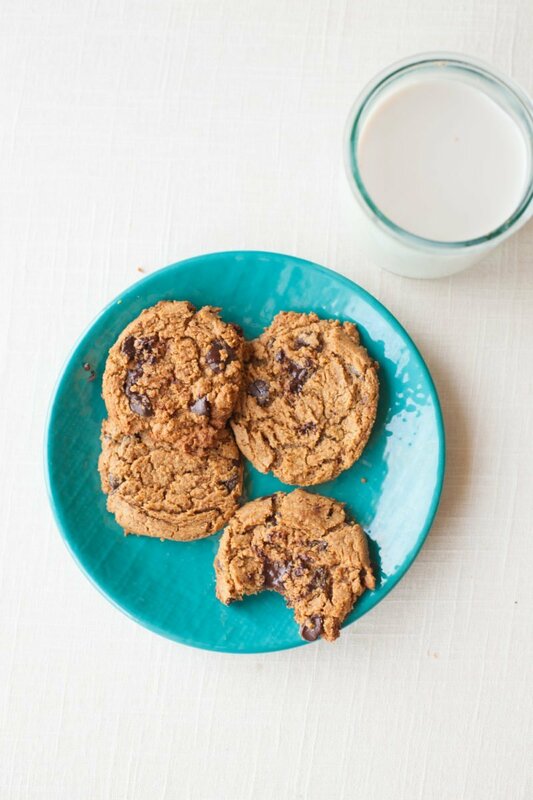 These almond butter cookies are buttery and tender and sweet and rich and chocolatey. They are naturally gluten-free and dairy-free (if you choose vegan chocolate chips). I’ve been making and loving them ever since! These cookies are totally flourless—and I’m not just talking using a flour substitute here—no weird flours or meals or gums or crazy additives that you have to find from a specialty health food store. Even without the flour, they bake into gloriously soft pillows of deliciousness. In fact, they are so soft and tender, that when you pull them out of the oven, you’ll think there is no way they are ever going to solidify, but I promise they will. 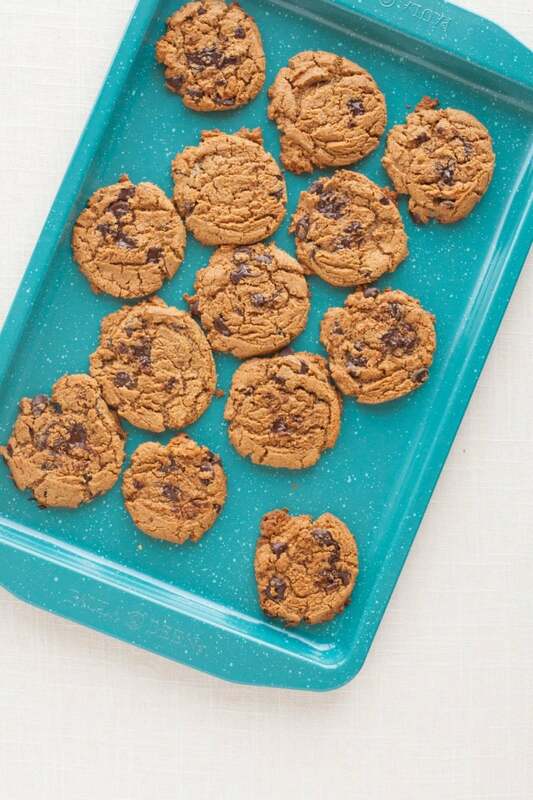 Unlike a lot of cookies, you’ll want to let these babies cool completely on the cookie sheet before moving them. And don’t even think about baking them until they are solid—if you do, when they cool, they’ll be hard as bricks (trust me, been there). 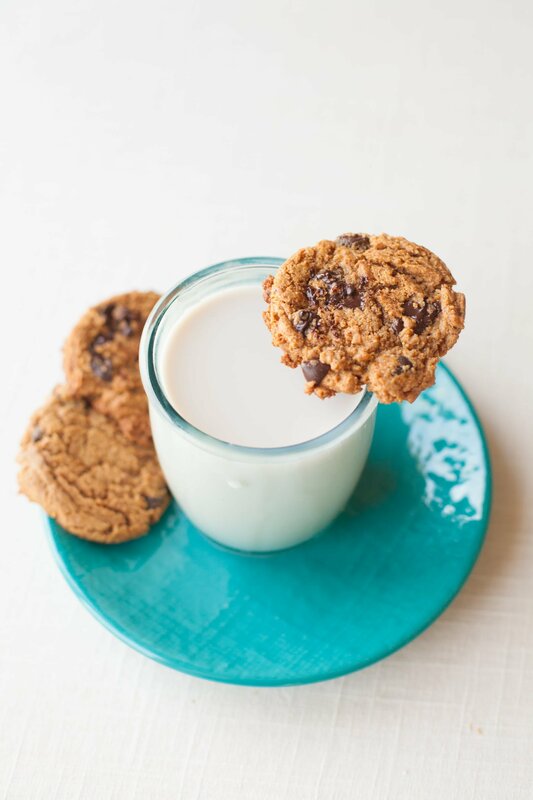 Nothing a dip in a cold glass of almond milk can’t fix, but it’s better to err on the side of too soft. For me, they are ready at right around 10 minutes in my oven. If you’re tempted to try to sub in a more natural sweetener (say, honey or maple syrup) for the sugar in this recipe, fight the urge. I’ve tried it, and it just doesn’t work. You need a dry sweetener to make the texture of this batter stick together. If you’re looking for a more natural option, try coconut sugar, turbinado sugar, or sucanat—which are all less processed than straight up granulated white sugar. But remember: sugar is sugar no matter the form, so try not to wolf down the entire batch of almond butter cookies on one sitting, k? It’ll be hard, because yum, but try. And before you ask, yes, you sure can use peanut butter (or sunflower butter) in place of the almond butter! 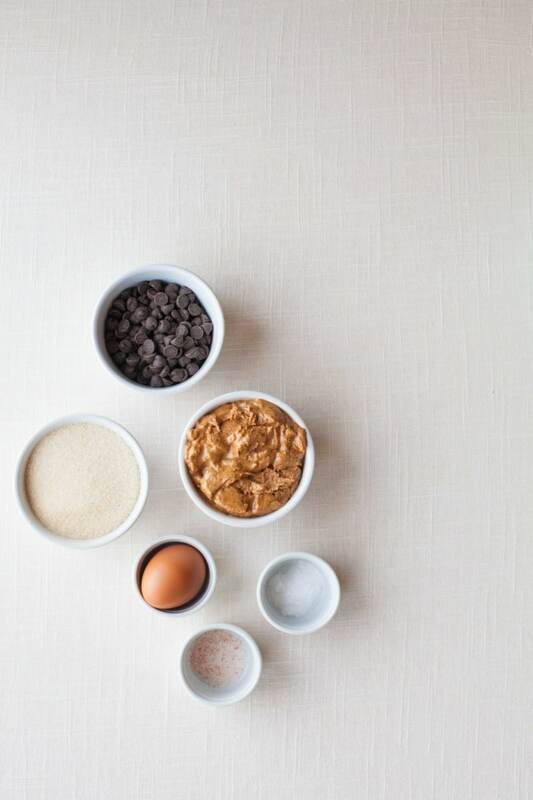 Just make sure to use unsweetened, natural nut butter without additives. 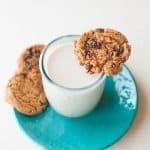 But, before you go swapping out the almond butter, let me tell you that I’m not a big fan of almond butter—I have texture issues with it—but I love it in these cookies. These cookies are pretty much the only thing I use almond butter in. Enjoy! These Chocolate Chip Almond Butter Cookies only require six ingredients, are dairy- and gluten-free…and still manage to be decadent and rich! Preheat oven to 350°. Line a baking sheet with parchment paper or a silicone baking mat. Set aside. In a medium-size mixing bowl, combine all ingredients until smooth and creamy. 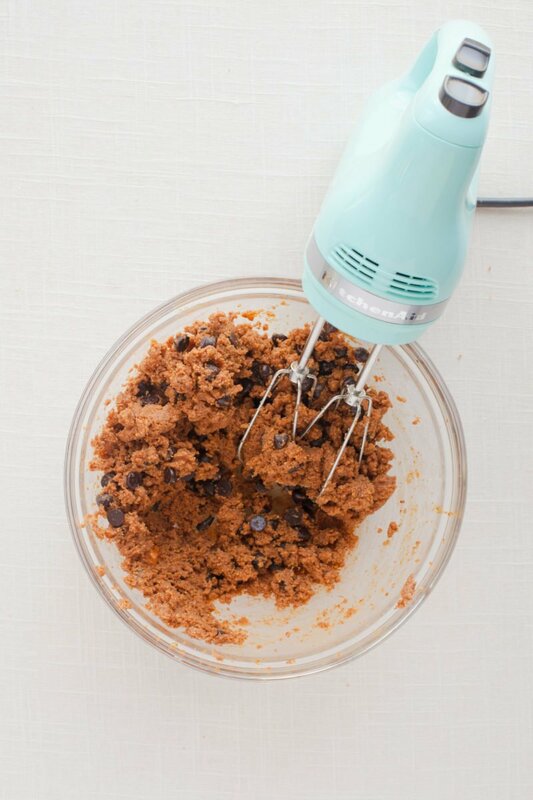 A hand mixer or stand mixer might make this a little easier. Scoop rounded tablespoonfuls onto the baking sheet, and press down with the bottom of a glass slightly to spread out. Bake in preheated oven for 9-12 minutes, or until the cookies are beginning to crack on the edges and look slightly brown. They will still be very soft—do not wait until cookies set-up to take them out of the oven. You don’t want to overbake these, so err on the side of underdone. Let cool for 15 minutes or so on the baking sheet before transferring to a wire rack to cool completely. Store in an airtight container at room temperature for up to a week. You can sub in peanut butter or sunbutter, just make sure they are natural, unsweetened versions. holy cow. I fall more in love with your blog with every single post. yum…adding these to one of my SP cookbooks to try in the future..love the healtier versions of all the foods I love!! What is sucant? Is it a flour substitute? Where can I get it? It’s an unrefined sugar. Sometimes it is also called whole cane sugar and is considered the most natural of all sugar. Since it is so minimally processed, it retains most of it’s molasses qualities, including a nice chunk of iron. Easy and delicious, I’m all over that!!! Could stevia replace the sucanat? I’ve never baked with stevia before, but I’ve heard it can be done. Have you ever tried it? Hmm, I’ve tried stevia before and I never really liked it. To me it tasted very bitter and I just couldn’t get over that. I’ve never tried baking with it. If you do, let me know how it turns out! That would be perfect! Just make sure to seek out vegan chocolate chips, which are pretty readily available nowadays. Where in Canada do you live? We have dreams of making it back there at somepoint (maybe in 40 years after retirement, ha!). We’d LOVE to live in BC. These cookies sound absolutely INCREDIBLE! I’ve been craving a really good peanut butter cookie but haven’t found anything yet to really satisfy… these look like they’ll be just the ticket for this pregnant lady! Ahh! Finally, something to satisfy my (gluten free) cookie urge that doesn’t look like/taste cardboard. So excited to try these out this weekend! Just made these with sunflower seed butter and rice sugar (I live in Germany where it’s called “kristalline Reissüße” and am not sure if you can get that in the US – it’s crystalized brown rice syrup with the texture of very fine sugar) and they turned out so well! They spread out a bit because of the rice sugar I think, but the flavor was great and the texture very tender and buttery and not too sweet. Thanks for the recipe! I really wanted this to work but it was a huge fail! I have no idea why but the oil separated first during mixing then baking. I couldn’t get it to stay together like a cookie so made it into a bar, but even that doesn’t seem to have worked! So sorry to hear they bombed for you! I have no idea on the oil separation—I usually don’t have a problem with oil separating in almond butter (unlike natural peanut butter), so I don’t even know where to start. Sorry I’m not more help! I’ve made cookies like this before — I love to add in some espresso powder. Soooo good ? How can I sub the egg? I haven’t tested it with any egg substitutes, so I wouldn’t recommend it. Baking is tricky when it comes to using egg subs! You can use 1/4 cup of unsweetened applesauce in place of one egg in most baking recipes. I just made these exactly as instructed (using coconut sugar), mine are not flat at all! They never spread out so they’re still a big blob. Not sure why that would be…. They tasted ok but I took your advice to use Ghirardelli choc chips and I really don’t like them, they’re tangy or something. I’ll try these again with a different choc chip maybe. Wonderful, liked the texture very much!!! But is there an option to reduce the sugar in half or even more without changing the texture too much? Because they were too sweet for me… I’m trying to consume less suger. I’ve never tried reducing the sugar, but I’d start off by trying to reduce it 2 tablespoons at a time. I’m assuming you could probably take as much as 1/4 cup out without it effecting the texture too much (but again, I haven’t tested it).